Last weekend three amazing bloggers and I were invited to attend London Fashion Weekend as a VIP on behalf of jewellery and accessorises brand Folli Follie and we had the most amazing time. With our Luxe tickets in hand and Folli Follie handbags dangling from our wrists we entered Somerset House not knowing what to expect, but was greeted by an array of the most luxurious fashion items at discounted prices, a range of quirky activities to participate in and a 4pm catwalk show to look forward to. We started our morning relaxing in the Luxe lounge being waited on with Champagne and canapés. Sara, Lyla, Natalie and I had never met before London Fashion Weekend so it was great chance to get to know each other and plan ahead for the day. Two of us travelled several hours to get to London that day, but as the day progressed we soon realised getting up at 5.30am was worth it in the end. As we strolled through Somerset House and the fashion exhibitions and stalls, I came across lots of items that either really intrigued me or that I wanted to buy. These gorgeous glasses on display at the Sunglasses Hut really grabbed my attention. As someone who loves collecting sunglasses and loves everything floral, these are two of my favourite items combined. The flowers etched on the side of these sunglasses are quite striking whilst on the rack, yet when worn they look rather subtle and give the wearer an edgy, vintage twist. 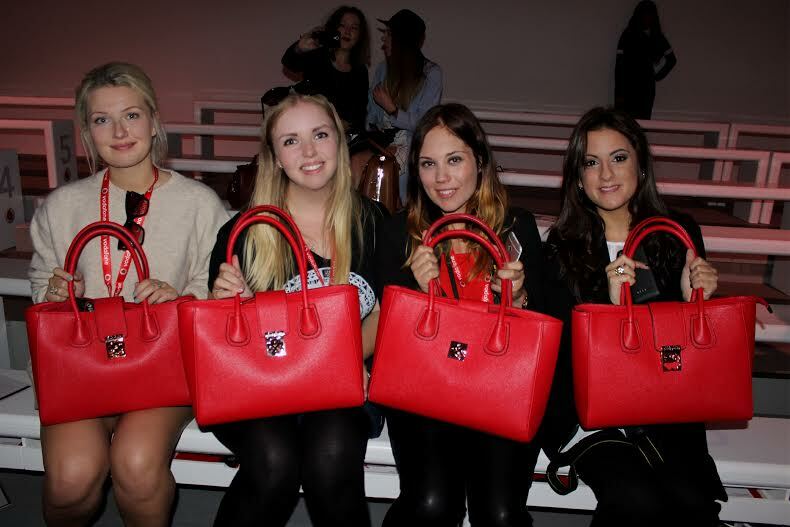 Also on display at Somerset House was these cartoon inspired handbags that many bloggers are currently raving about. I find them a little bit too daring for my everyday wardrobe, but I can see many quirky fashionistas falling head over heels for them. Although it is commonly rumoured that those in fashion rarely eat, there were many fashionable people flocking towards the Propercorn stall in the west wing. Propercorn is my favourite popcorn as the flavours are so mouth wateringly delicious and the popcorn is low calorie. It's perfect for those who love to snack, but still want to keep their figure. Finally it was the moment we had all been waiting for - the London Fashion Weekend trend catwalk show and to make us feel like celebrities for the day, each of us were given front row access. The clothes provided for the catwalk show came from the Outnet, one of London Fashion Weeks main sponsors and for those who have never heard of the brand, they are the baby website of the world renowned fashion emporium Net-a-Porter. The catwalk show featured four key styles: One and Only bolds - a parade of autumnal colours with splashes of bright key pieces, Kandee Crush - a pastel inspired catwalk show, Jungle Fever which exhibited lots of leopard prints and lush fabrics and finally the Fairytale trend which was full of embellishment and whimsical styles. My favourite outfit of the day had to be this gorgeous Oscar de la Renta dress that had the entire audience 'ooohing' and 'aahing' as it glided along the catwalk. The bright colour and fairytale a-line cut had every woman wishing they had thousands of pounds to spare on this little beauty. I had the most amazing day in London and cannot thank Folli Follie enough for the experience. It was lovely to spend the day with three fabulous bloggers and absorb all the beautiful fashion surrounding us in one of the worlds most fashionable cities. If you have ever thought about going to London Fashion Weekend but couldn't make your mind up, I would really recommend going. Have you been to London Fashion Weekend before? wow! It looks like you had an amazing time! Looks like a great opportunity! love the bag!